CDizz is an innovative, free media player that upgrades any music file or CD into a rich multimedia experience. 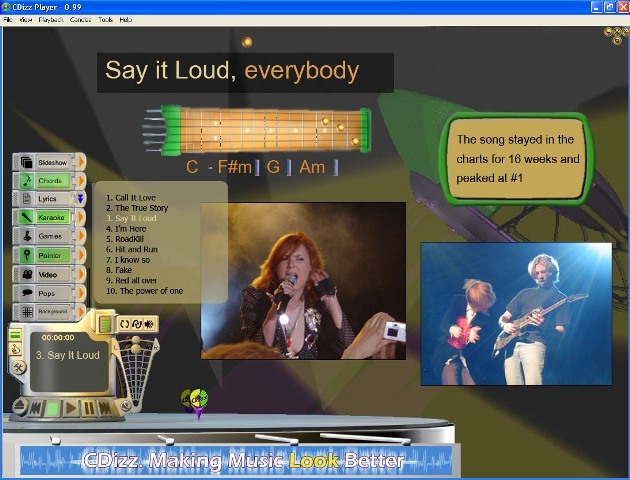 Using music identification, the player displays designated dynamic online content. Lyrics, Images, Flash Animations, Animated chords, Karaoke, Video Clips and more, including user contributions. By getting both official and user-generated content, users actually connects to a social network based on their taste in music. Create a personal profile page with a list of your music collection. Upload your own contributions and share them with other people in your network. Receive CDizz Pointzz for every upload. Innovative Media Player with streamlined design.